The Akada Children’s Book Festival (ACBF) is a fun festival to showcase children’s books by African authors, or books written for children of color. It is an event for children, parents and teachers, as well as those who create child-appropriate content. Billed for April 27th 2019, the festival is an initiative of the publisher of Clever Clogs Books, Olubunmi Aboderin Talabi and will be hosted in partnership with the British Council, at their premises in Lagos. The 1-day festival will also feature fun activities – treasure hunt, play area, pop-up library, face painting, arts and crafts – for children (aged 13 and below). It will also feature information forums for parents; workshops for writers, upcoming authors and illustrators; soft skills masterclasses for teachers and much more. NOTE – Entrance to the festival is FREE but registration is required. 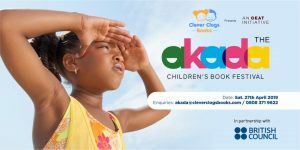 Groups of 10 and above may also register by sending an email to akada@cleverclogsbooks.com.